Jamaica is defined by its pristine sandy shores, and some of its best are in ‘MoBay’, as the locals call the area. A particularly renowned spot is Doctor’s Cave Beach, named so because it was once owned by a doctor who donated it to a local swimming club. Although there is a small entrance fee, it’s well worth it, as the quiet sands are perfect relaxing. However the nearby water sports facilities, eateries and golf courses mean the beach suits the more active of travellers equally. Known as the ‘hip strip’, most of the hotels, restaurants, bars and souvenir shops of Montego Bay line this parade. The strip runs parallel to the beach and boasts some of the best eating options on the island. Centred on pedestrian Sam Sharpe Sq, Downtown fans out over a grid, its cobbled roads reach competing storefronts, ridden by pushcart peddlers who seem to appear out of thin air on every corner. Downtown is a breath of fresh air from trinket tourist streets, featuring a selection of decaying Georgian buildings and the excellent Museum of St James, which bears poignant testament to the city’s brutal slave history. Aside from being one of Montego Bay’s main shopping ports, Freeport built in the 1960s, consists of five primary berths – two of which are dedicated exclusively for cruise shipping – making it a great photo spot. Rose Hall has an incredible past. The Great House was once the home of the notoriously evil Annie Palmer, the ‘White Witch of Rose Hall’, who murdered three husbands and terrorised her slaves. Two U.S. entrepreneurs, John and Michele Rollins, restored the building to its original glory, complete with period furnishings and lavish decor. Upon visiting, expect to get your bloog chilled as charming Jamaican hostesses tell tales of the evil Annie. There’s no need to fear though – a walk in the beautiful gardens is certain to restore your equilibrium. And if it doesn’t – head to Annie’s Pub in the dungeon of the Great House for something a little stronger to calm your nerves. Situated on Walter Fletcher beach, Aquasol theme park offers a go-kart track with 10 Honda bumper carts, plenty of water sports (including kayaking, parasailing, banana boating and glass bottom boating) and sporting activities such as trampolines, wave runners, beach volleyball and two professional tennis courts. For when you get a bit peckish, The Voyage sports bar and restaurant serves excellent food, in front of 42 big-screen TV’s for sporting events, pool tables, slot machines and many other games. While it’s entirely possible to fritter all of your time away on the beach, Jamiaca offers so much more than that. 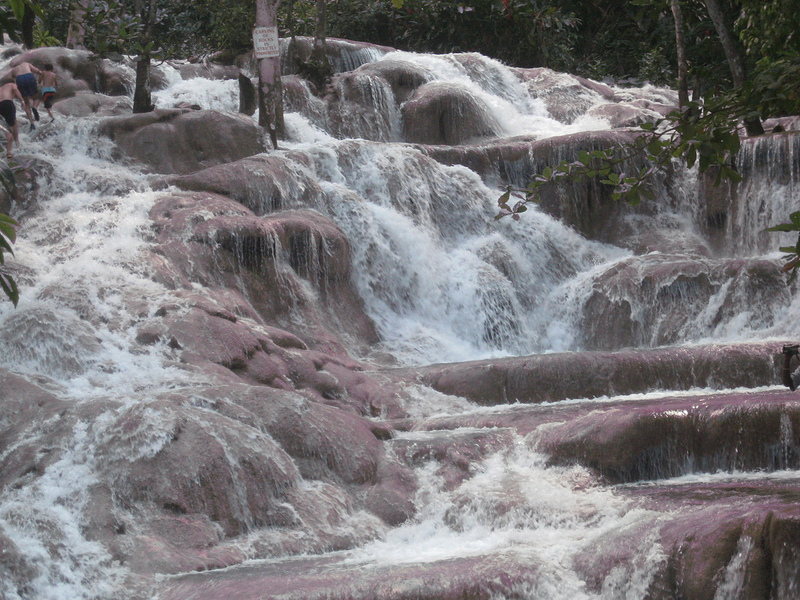 Dunn River Falls is a place where the fresh rain water cascades down stone terraces that cut right through the dense Jamaican rainforest and empties out into the Caribbean. Located between Ocho Rios and Montego Bay, this sublime spectacle puts the beach to shame. Not only can you see the beauty of the falls, but you can also climb up the cascading water from the beach below. From Montego Bay there are several tours available, but the least expensive option is to take one of the shared mini buses that drop you off right in front of the entrance. It takes about an hour and half each way for just a couple of quid. Whether you’re looking for authentic Jamaican cuisine, something British or even a curry – Montego Bay has it all in terms of restaurants. There’sThe Houseboat Grill, situated in the calm waters of the Montego Bay Marine Park Fish Sanctuary. This unusual floating restaurant offers a unique setting for an intimate, one of a kind dining experience and some of the freshest fish in Jamaica. Or, Day O Plantation Restaurant, located in the lush tropical hills of Montego Bay City, is surrounded by a colourful tropical garden. Here you can sample the finest in Jamaican and foreign cuisine, all within elegant Jamaican splendour. Or, why not head to the Hip Strip to a local and tourist favourite alike, The Pelican Restaurant (no website). Well- known as one of Montego Bay’s best places to find mouth-watering Jamaican cuisine, their menu features classic Jamaican specialties like steamed red snapper with okras and bammy, ackee and salted codfish with boiled green bananas, yam and fried Johnny cakes. Book a cheap holiday to Montego Bay Jamaica with Purple Travel (ABTA member) by calling us on our free hotline 0207 993 9228.